This past Monday evening, I was emceeing the 2013 Canadian Booksellers Association Libris Awards at the Toronto Congress Centre. It was wonderful meeting, and having dinner with, the legend Alice Munro, and spending time with Will Ferguson, one of the nicest and funniest (he’s a three-time Leacock Medal winner) writers we have in this country. 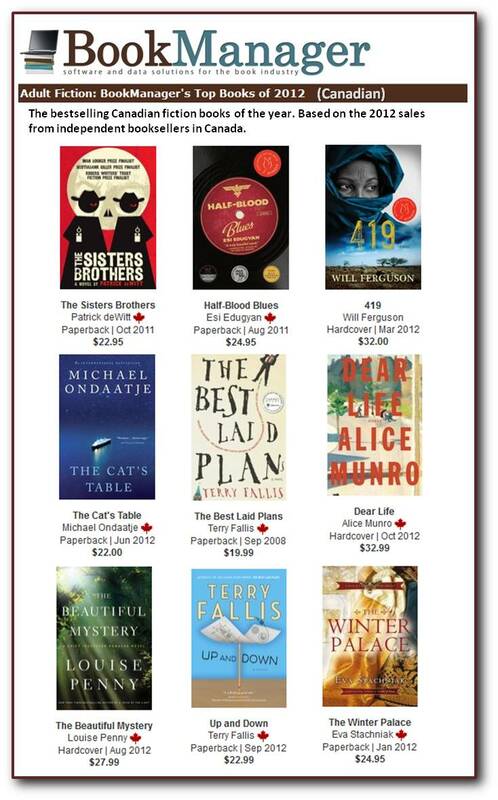 Much to my surprise, I was actually a finalist for the 2013 Author of the Year award alongside Alice Munro, Will Ferguson, and Nancy Richler. I spent a good part of the night shuttling from backstage to the podium, introducing each award and the resepctive presenters. When it came time for the Author of the Year category, I was quite happily backstage as reigning CBA President, Mark LefebvreÂ (who writes as Mark Leslie), took the stage to rip open the envelope (yes, they actually do the whole “…and the winner is…” routine) and announce the lucky name. Fortunately, I was backstage at the time, fully expecting to hear one of the other stellar writers’ names called, when Mark distinctly read my name. It took me a moment to find my Â jaw on the floor, it was quite dark backstage, before I wobbled back onto the stage. I thanked the many independent booksellers with whom I’d worked over the preceding five years, paid tribute to my wonderful publicist at Random House, Frances Bedford and my literary agent, Beverley Slopen, and offered my deep appreciation to my editor and friend, the incomparable Douglas Gibson. Finally, I just closed by saying that there had never been a more grateful recipient of this honour. Then gathering myself, I switched back into emcee mode with my knees still knocking, noted that we were “now returning to regularly scheduled programming,” and introduced the next award. Then I darted backstage to hyperventilate until I had to return to the microphone to welcome the next presenter and generally keep the trains running on time. Believe me, I was very thankful for the distraction of my emcee duties. 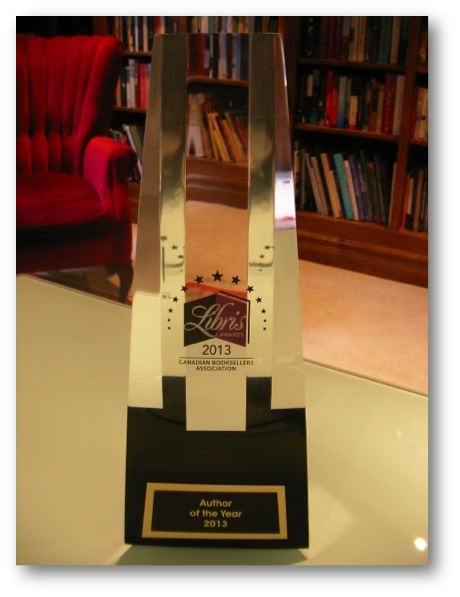 As I said in my closing remarks, when I think back, years from now, on the 2013 CBA Libris Awards, I suspect I’ll remember very little about my duties as emcee. 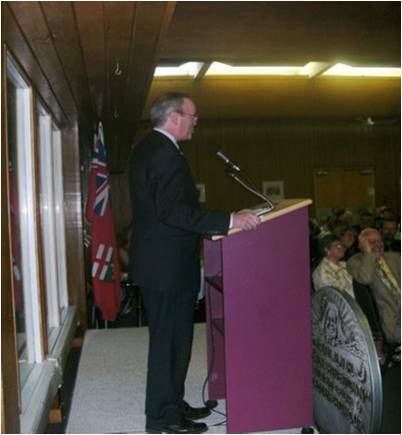 It was truly an honour to return to Orillia a few weeks ago for my third consecutive Leacock Gala to celebrate the winner of the 2010 Stephen Leacock Memorial Medal for Humour. I was asked to “emcee” the evening so I was a little anxious about it all. I need not have been. The Leacock community is so warm and welcoming that I was immediately put at ease at the podium. 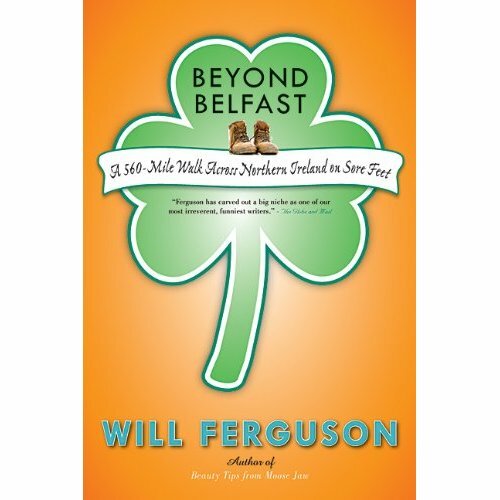 The winner this year is the hilarious Will Ferguson for his funny nonfiction book, Beyond Belfast, chronicling his walk around Northern Ireland in search of his family history. He is a very nice guy, just like his brother Ian, another Leacock winner, and as you might imagine, a very funny guy too. Will joined a very select group this year as one of only five three-time Leacock medalists. You might say he scored the Canadian humour hat trick. I thoroughly enjoyed spending some time with Will and with all the Leacock stalwarts in Orillia who do so much to stoke the fires of humour writing in Canada. 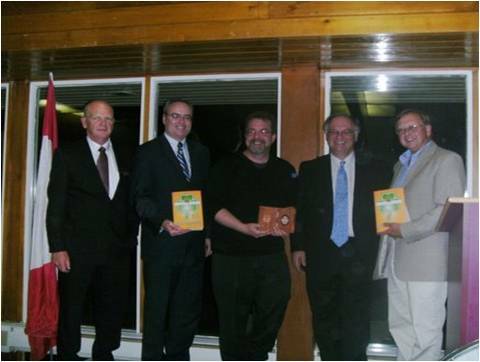 As you might guess, Orillia and the Leacock Association have become very special to me, and I couldn’t be more grateful for what the Leacock Medal has meant in my writerly life. Here I am trying to keep the trains running on time at the Gala. 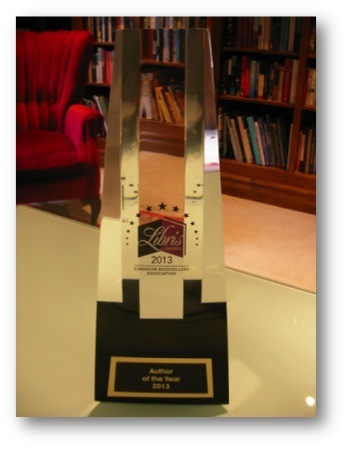 Will Ferguson wins the Leacock…again! Will Ferguson won the 2010 Leacock Medal last Thursday, his third. 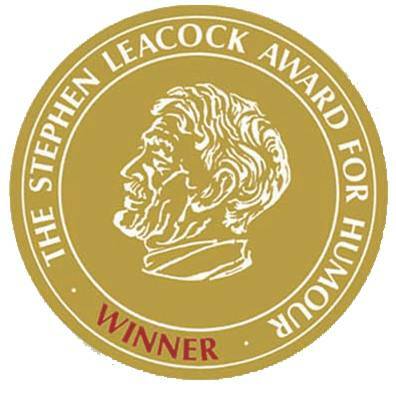 He is now the fourth writer in the history of the award to earn a trio of Leaocks. Very impressive. I would have been in Orillia for the announcement had I not been so fortunate to be in Cambridge for the announcement that TBLP had been selected for the Waterloo Region’s One Book, One Community program. Will won for his new book, Beyond Belfast. I’ve not read it yet, but it’s near the top of my list. Writing and winning Leacocks run in the Ferguson family. 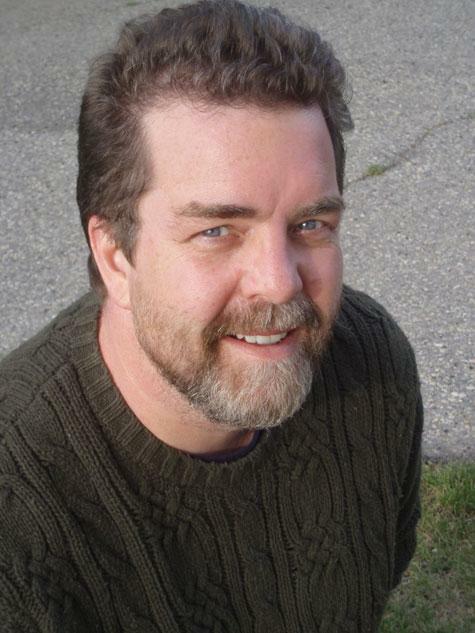 Will’s brother Ian, won in 2004 for his wonderful book Village of Small Houses. I met Ian at last year’s Leacock Luncheon and have kept up an email coresspondence ever since. As well, Ian has provided a wonderful quotation that will appear on the back cover of The High Road (stay tuned to see the back cover design). I look forward to seeing him again soon. In June, I’ll get to meet Will as I’m the master of ceremonies for the Leacock Gala dinner.Â Congratulations, Will, and I’ll see you in June to shake your hand!